Just finished my fifth hour of talks this week, give or take. All fun, and more to do next week. In the mean time I'm rather looking forward to a break this weekend. That said, Beijing is pretty much shutting down over the Olympic period with many of the best places simply closing for the next month. My old hangout D22 which has live music and movie nights had sudden licensing problems and is locked for the time being, while the clubs in the local student area are all closing for the next month and a bit. I'll try and head to the 798 art district this weekend if I can, as I'm hoping they won't have had sudden problems with the surprisingly political artworks on display. In fact this is the tip of an iceberg which essentially means that many of the local residents of Beijing are feeling pretty peeved about the fact that the Games are coming to town (ok, most that I've spoken to). You ask them in a formal context what they think of the Olympics and you will find out that this will be a wonderful display of modern China to the rest of the world and a moment to be proud of, but you ask them in private and most of them are pretty tired of the armed guards on the streets, the extra security checks all over the place, the closing of many venues, the hike in prices and many other things besides. Many of my foreign friends here are having there lives even more disrupted by huge restrictions on the visa process. At least half of my friends here are having to leave the country in the next week or so, having to temporarily ditch their jobs and wait for things to ease up. Many of those who are staying are finding sudden, surprising increases in their rent which landlords apply unapologetically. Anyway, enough on the negative side. I thought I'd post up another photo today, this one from my flight from Dusseldorf to Beijing last week. 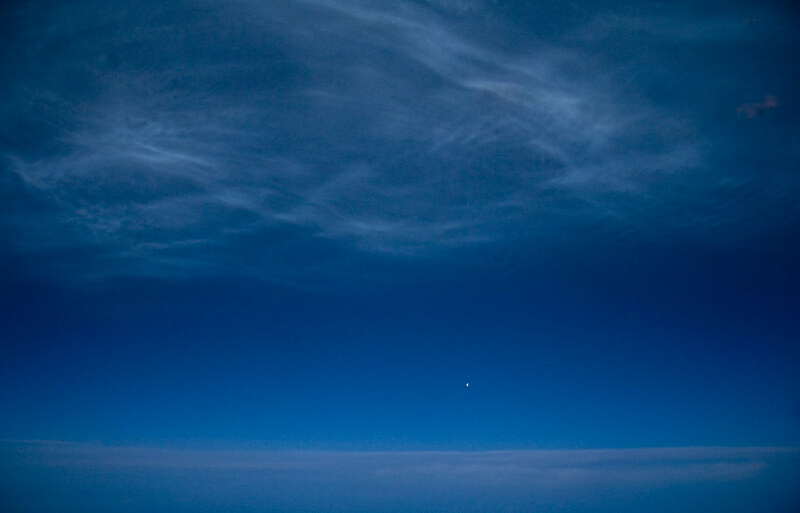 At around 4 in the morning, somewhere over Mongolia we had a wonderful display of noctilucent clouds. Clouds high in the atmosphere that even after sunset are still lit by the light shining from below the horizon. Their pattern and colour are very distinctive and are really quite stunning. The bright light in the middle is Jupiter. See more here for information about such cloud displays.